The WorkCentre 4150 Series multifunction meets the challenges of today's non-stop business world. Its design started with the basic requirement of every office: powerful printing capabilities. Then an array of tools was added to create a reliable and convenient multifunction that is ready to handle the needs of your busy workgroup. 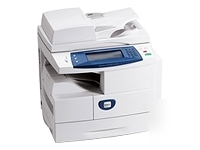 As the multifunction system experts, Xerox understands how to streamline the way you work to help you get the job done.